Get affordable Security Camera installation on Santa Monica, CA and CCTV equipment with commercial quality and 2 years warranty. The security cameras help to reduce the crime rate. Having a security camera system in your home or business, it will be significant crime deterrent. Security camera systems are an important part of keeping any your home or business safe. There are a lot of brands and types of security cameras in the market. Choose the right system for your property can be difficult. Protection4Less security consultants are experts in security cameras and monitoring, they will help you to get the perfect security camera system. We exactly adapt every surveillance system to your needs. We can install night vision or infrared high definition security cameras to monitoring: your windows, your doors and your garage. 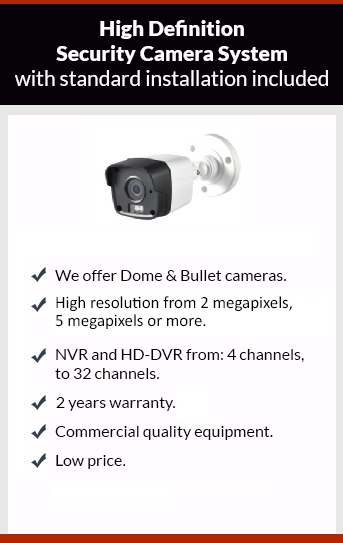 We have several types of security cameras like: bullet, dome, box, PTZ, etc. these types of cameras can come on different resolutions from 1 megapixel to 5 megapixels or more. The installation of the security camera system is really important. A good installation will make your system last longer with no issues. Protection4less provide you a professional installation; this means that we use the right cable and the right camera for the location. We will run the wires in a proper manner using the attic, or sometimes installing conduit pipe. We will need to run a cat5e wire from your router to the DVR or NVR. Most of the customers want to have access from their security camera system to their smart phones. To achieve the remote monitoring the customer must have an Internet modem in the location. The NVR has to be connected to the Internet router with a Cat5 cable, after this we will need to do port forwarding programing in your router. With all this you will be sure that you have access to your cameras at home, or remotely through smart phone.